Let me tell you about our little adventure. A mini road trip if you will. We crammed quite a lot in so I'm breaking it down into 2 or 3 posts. Mr C and I had two weeks off work at the beginning of September and were hoping to go back to our beloved Spain. Sadly, because we'd left it so late to book all flights were stupidly expensive so that wasn't really an option, and besides we've already been twice this year, yep we're greedy! We thought about what to do, I knew I didn't want to stay in the UK, if the weather's crap you often end up spending a fortune anyway, and we didn't want to waste our time off slobbing around the house. So France it was. But not flying. Driving. Not in a fancy hotel. Camping! Yes, in a tent. We booked our crossing with DFDS seaways (formally Norfolk Line) from Dover to Calais. I'm going to admit here that I was a little concerned about taking a ferry crossing with all the troubles at the ports, especially Calais, and two days before we were due to travel the French put a protest blockade in place stopping all traffic going in and out of Calais. Terrific. We rang DFDS and they happily changed our destination to Dunkirk instead of Calais. Mr C had booked the Premier lounge so we could travel in style. DFDS carry a lot of truckers so we were glad of the nice space to relax. 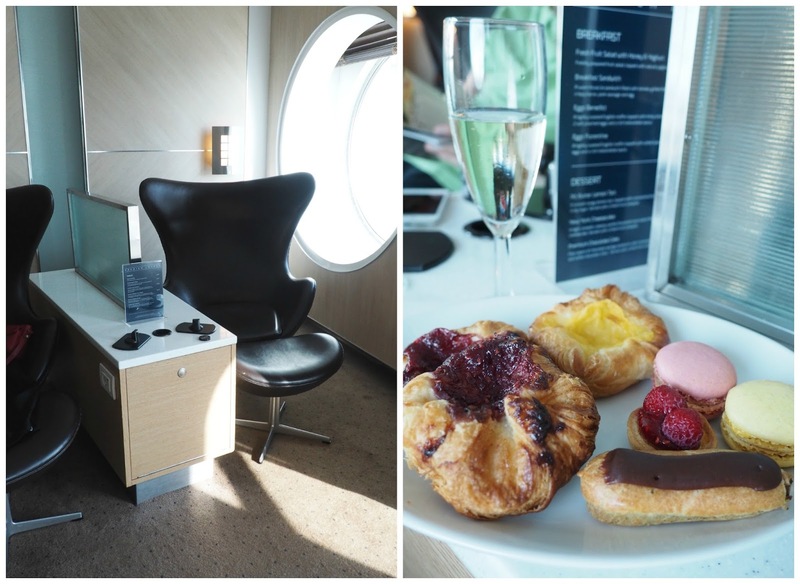 For the extra you pay you get comfy seating, pastries, unlimited tea/coffee, biscuits and a glass of fizz. Definitely worth doing in our opinion and we'd certainly book the Premier lounge again. It was a beautiful day to cross the channel so it was plain sailing all the way, we said goodbye to the White Cliffs of Dover and before we knew it, it was Bonjour Dunkirk. The whole journey from beginning to end was seamless, no hanging around, no queues, no delays. I guess because it was early September there wasn't too much holiday traffic although the car deck was more or less full. So before I show you any more, let me tell you about where we stayed any why. We've been to France a few times (think booze cruise), we've also been to Paris a couple of times but never thought of it as a real holiday destination, as I said Spain is our second home but after talking about visiting the champagne region (we both love champagne) and then seeing that Amelia from xameliax had recently been it made our mind up. Mr C had also been looking at the Brittany area, it had to be somewhere not too far, we certainly couldn't get to the South of France in the time we had (1week) so after looking at maps and campsites we decided we would head to the Champagne region first for a few days and then move on to Brittany. We found a campsite close enough to Reims, (there aren't that many in the region) and were told we didn't need to pre book. 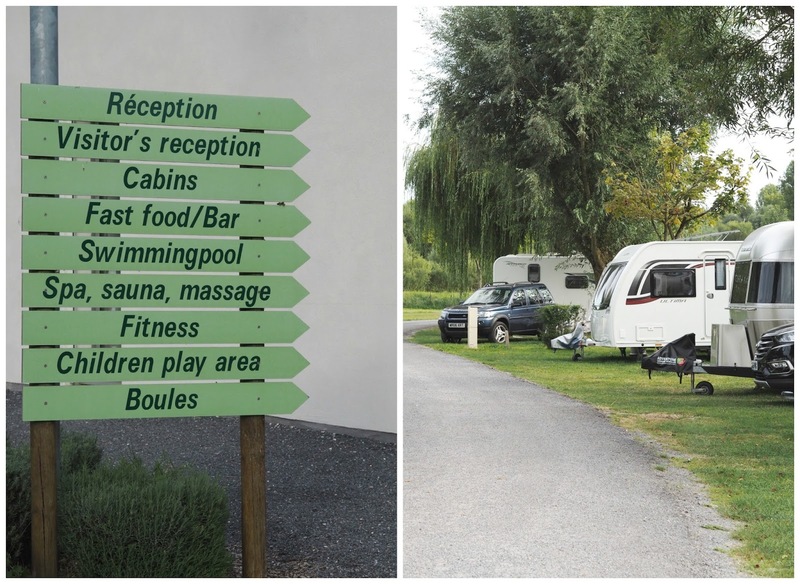 We stayed at Camping Au Bord de L'Aisne in a little village called Guignicourt and it was easy enough to find. It took us roughly 2 hours to get there and it's 3 minutes off of the A26 (toll road) which is the straightest and easiest road to drive. We were on the A26 for quite a while and thought it would cost us a lot in toll fees but we were surprised when we put the ticket in the machine and it asked us for only 17euros! Although when we got back, it wasn't a cuppa we wanted. It was so damn hot we made a beeline for the bar and bought our first bottle of champagne and sipped it in the sunshine. Bliss. When in Champagne. You'd do the same though right? Our little tent was perfect. We went camping a lot when the kids were little and even when they were teenagers, it's an adventure thing isn't it and all kids love it. We didn't go for our main holiday but just a few days here and there, that's all I could stand and Weymouth was our usual destination. We had a huge tent and in fact still have it. It can sleep up to 12 people, you could have a party in it to be honest, but we don't need it any more so we decided it would be best to replace it with a small one and then Mr C and I can just decide at the drop of a hat to escape somewhere for a weekend if the weather's good and we don't have to lug masses around with us and spend hours putting up what felt like a bloody marquee!!! This new one took around 20mins to put up and it has a really large bedroom and enough space in front for the kitchen unit and two chairs if we need to be indoors! It has a sewn in ground sheet, there ain't no bugs or spiders welcome in my tent and we even put down a carpet in our bedroom for extra comfort (it was actually a fold away picnic blanket). I was all up for getting a small weekend away tent but it was important we got one that we could actually stand up in, properly, no crouching or crawling around on your hands and knees. This tent fits the bill all round, we got it for £150 from Go Outdoors and it will last us years I'm sure. Windbreak (essential for privacy) we already had. I also refuse to sleep on an air bed. Had that experience of waking in the morning many a time to find it flat as a pancake and feeling like you've done ten rounds with Mike Tyson. No, proper camp beds for us with a self inflating mattress on top and a thick sleeping bag. Let me just say here that one of the nights I had the best sleep I've ever had in my life! Oh, and I won't go anywhere without electric hook up. Okay, so I'm not a proper camper, I'm a sort of glamper. Bovvered? What girl can go away without straighteners?! Do what makes you comfortable and happy is what I say, I mean you've got to enjoy the experience or you won't go again will you? Do you like my dressing room? All mod cons! Do you want to know a little about the site? Well, it's rather lovely. It's not one of these huge sites with hundreds of pitches, I think this one has around 80-100 pitches and it's run by a lovely family. Caroline, wife of Didier greeted us so warmly when we first arrived and told us we could select whatever pitch we wanted. All pitches are clearly marked out, we chose one by the river, although they don't offer a lot of shade. It's okay if you're just passing through on a stopover, but if you're staying for longer like we did, and it's extremely hot like it was for us then you might need some shade. Most people we spoke to (it's a very friendly community is caravanning & camping) were actually just passing through either on their way further into France, or stopping off one last time before they hit the ferry back to the UK. Even though it's not the cheapest of sites it's the handiest for everyone as it's so close to the motorway so they can kind of get away with charging higher rates. The site has all the facilities that you need including a swimming pool, albeit a small one and for the size of the site I think it could do with being a bit bigger. We had it to ourselves but I can imagine in the summer months it would be a tight squeeze for everyone. We had to use the pool on a few occasions just to cool down! It was so damn hot. Husband and wife team covered everything really from reception right down to general maintenance. We would find Carol manning the reception and bar in the daytime and then Didier would man the bar and cook the food in the evening. There's not a huge choice of food on the menu, mainly pizza and the odd chicken dish but it's good to have it there if you can't be arsed to cook yourself! There's boules to keep the adults entertained and plenty of play areas for the kids. There were only a couple of issues I had and downsides to the site. There's no toilet roll in the loos!!! None. Nada. Why, I do not know and to be honest it's not great carrying your bog roll up there every time you need to spend a penny (or the other!) so all and sundry know what you're doing :( Not good. And, there are no plug sockets in the bathrooms. I know most UK sites offer this so you can at least go and dry your hair standing upright. 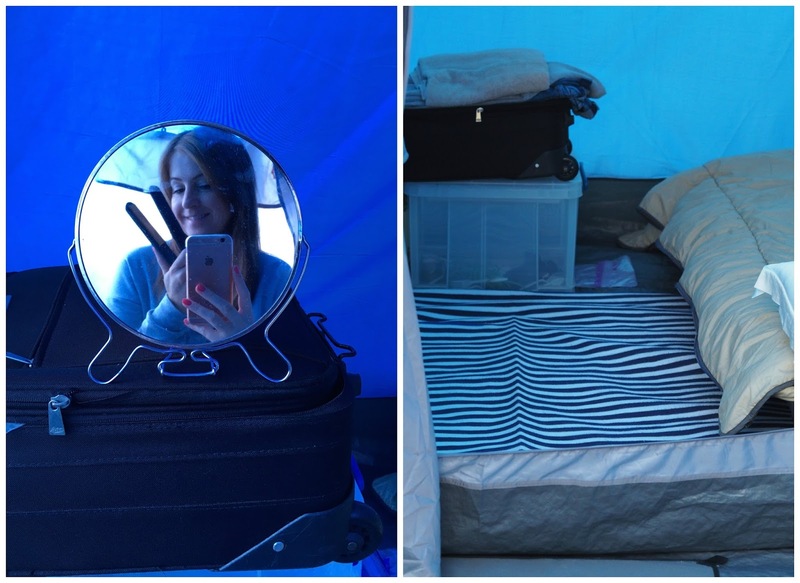 Here, yes you have electric hookup in your tent but you end up drying you hair sitting on the floor balancing a mirror on any level surface you can lay your hands on. There's not much in the tiny village itself. There's good size Carrefour supermarket, one little bar, bakery, newsagent, pizza takeout, train station, petrol station and that's probably about it. All about a 10 minute walk away. 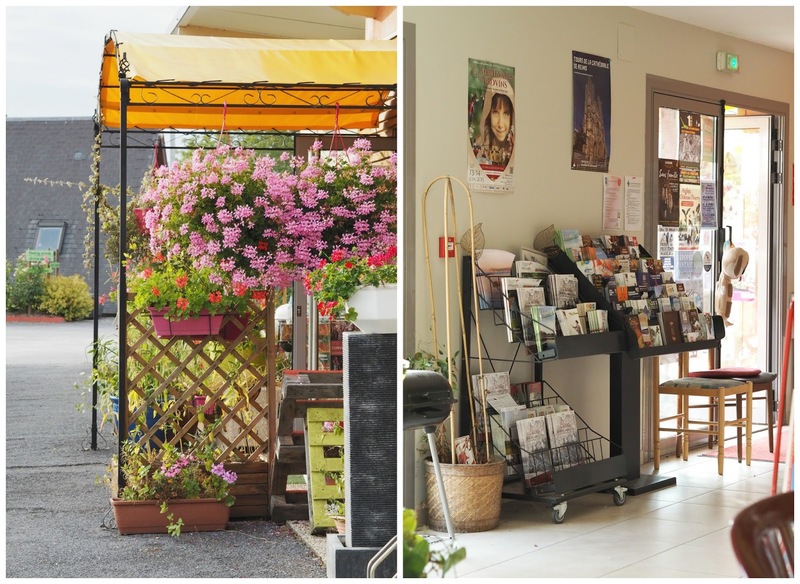 You can order fresh baguettes and pastries at the site reception for the next morning but Mr C and I always chose to walk to the Boulanger to get ours, as it was such a lovely walk through the village. Camping doesn't have to be BBQ after BBQ. Some may like that every single day but not us. I'm not the biggest meat eater so you have to be creative even if you only have one gas ring. And besides you can't keep meat cold without a fridge. You can get everything you need at the supermarket so Mr C knocked up a mint and pea risotto one night, curry another night and some lovely pasta dishes. I know it's perfectly acceptable to live on bread and cheese whilst en France but I guess you have to have a bit of variety. Just had to didn't we?! To be honest we were so lucky with the weather so cooking outdoors was made real easy. We had near on 30 degrees most days with hardly a cloud in the sky, it also made my longer camping experience a good one. Remember I mentioned at the beginning we were going to do a few days here and then move on to Brittany. Well, we looked at the forecast and it was showing rain and cloudy days for Brittany so we decided to stay put for the whole week. I mean who would head to cloudy skies? Yes, this campsite is not a cheap one but we figured it was okay as we were saving on the fuel costs to Brittany and there was more than enough for us to do and see. I'm going to leave you with the picture of macarons and me plotting and planning our french adventure. Until next time mon amie......... :) There will be plenty of champagne! 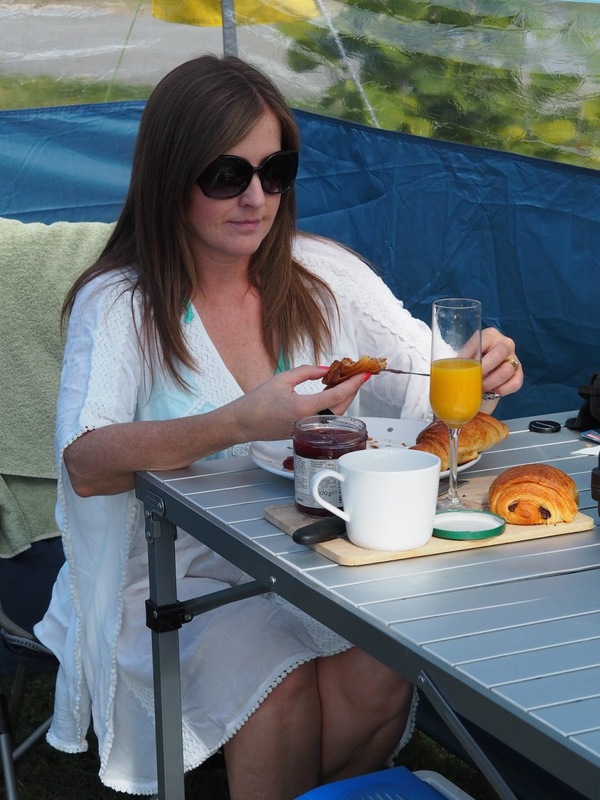 Oh, if you want more details on the campsite you can find them here because quite frankly if camping is your thing it's ideally located to explore villages and tour the champagne region. Nice! I have been in Brittany, but in a gite, loving the walking, the food, and the sights. I look forward to hearing more about your stay - do visit me in Brittany! This looks like a lovely site. I've never tried camping but I think a site with a swimming pool might convince me to!